Please note this is for Swinburne students only. 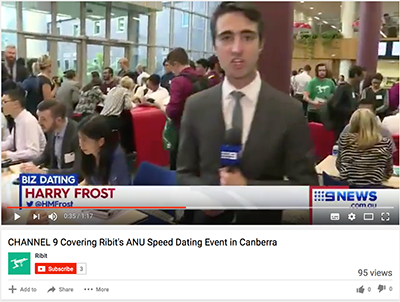 Ribit has partnered with Swinburne University, to host Australia's very first PhD speed dating event, connecting the talented PhD research students of Swinburne University with short-term and project-based opportunities with the next generation of leading companies and startups. We are looking for students with skills in machine learning/AI, augmented reality and statistical modelling. We are looking for students who can provide us with educated insight into the future of the human resources industry and how we will engage with HR managers. We are seeking interns that are interested in business strategy and market research, who are capable of working with us to deliver projects for external clients. We're seeking data science skills to support the development of new products. Also, we're seeking for software development skills to support senior developers in developing new products. We are looking for students to assist with upgrades to platform and database, client support and troubleshooting throughout the pilot and marketing/educations of features and benefits to the existing and future users. This is a combination of geospatial & agtech skill sets - data science, machine learning for example - along with a passion for interfacing with users. We are looking for help with identity/privacy issues on our HubWorks technology platform. We are also looking for students with business intelligence and nutrition expertise, with skills in R&D, data science and medtech. We're seeking a front-end web development intern to assist us with creating sample use-cases atop our blockchain APIs. We are looking for students with skills in business planning, assurance, data analytics and organisational transformation. We are offering roles in software engineering - image processing, mechanical design and electronic design. We are looking for students with skills in programming, optimisation and modelling to solve problems in transport and logistics scheduling, workforce management and production scheduling. We are a defense group working in integrated technology, environmentally friendly mobility and threat-appropriate security technology. We provide emerging technology solutions to businesses to help them become leaders in their field. Our specialisations include Digital, Analytics and Cloud technology solutions, and our aim is to become the leading Internet of Things consulting organisation. We're seeking a data scientist intern to work on several experiments we're running to ultimately adjust games individually for each player based on player behaviour. We are looking for students with skills in computer science and IT engineering to optimise our peer to peer parking application. We are seeking software developers, business and finance professionals with a passion for innovation who want to help drive technology led transformation in the fintech/taxtech area. We are looking for students with skills in programming and web development, marketing and business. AMSI Intern and Business Foundations will also be at the event who can help connect you with research projects from an even wider pool of opportunities. Are you a business looking for student talent to research and address needs within your company? Want to meet students with in demand STEM, digital and research skills? Check out the coverage from one of our past events.